It would be impossible to count how many times I’ve read a book and, sometime afterward, seen the movie based upon it. Dozens, I’m guessing. Maybe hundreds. On rare occasions—“True Grit” by Charles Portis comes immediately to mind—I’ve seen the movie first. But I’m pretty sure I’ve never finished reading a novel and then gone to see the movie the very next day, while the story was fresh in my mind. 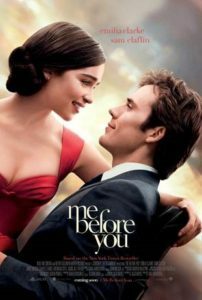 It finally happened last week with JoJo Moyes’s megahit “Me Before You.” I likely wouldn’t have chosen her book on my own. But it was selected by a book discussion group I belong to, so I bought and read it. And didn’t, thank goodness, hate it. Though the writing never made me want to grab a marker and start highlighting, neither did it make me roll my eyes as I sometimes do when reading “women’s fiction.” The story, set in contemporary times in a small English village, is intriguing. Twenty-six year old Louisa Clark takes a badly needed job as a companion for Will Traynor, a young man with a family so wealthy they own their own castle. Will, once a successful financier and extreme athlete and adventurer, is now a quadriplegic. Though his mind is still sharp and his face still breathtakingly handsome, he’s confined to a wheelchair, unable to do anything for himself. Lou soon discovers that she’s actually on suicide watch. Will, whose spinal cord injury is unfixable, wants to die. His parents have reluctantly consented to take him to a facility that will allow him to end his life with dignity if he will give them six months to change his mind. They’re hoping that quirky and vivacious Lou can show him that life is still worth living. Is she up to the task? I’ll never tell. Because wondering what will happen is what makes a reader finish this or any other book. It certainly kept me turning the pages—more than 400 of them—to find out what becomes of Will and Lou. And even when I knew the answer, it didn’t keep me from spending two hours on a steamy Saturday afternoon in a cool, dark theatre checking out whether the movie told the same story. It almost certainly would, I predicted, since Moyes herself also wrote the screenplay. And it did. Except that the movie turned out to be better than the book. Maybe because both Emilia Clark (Louisa) and Sam Claflin (Will) are not only oh-so-beautiful but also oh-so-likeable and believable. They made it impossible for me not to put myself in their place and to feel their emotional pain. Would I want to live for decades, even with someone I desperately loved by my side, if I couldn’t dress myself or feed myself or swat at a mosquito? Could I pledge my eternal love to someone who would never be able to dress himself or feed himself or swat at a mosquito? Heart wrenching questions. No easy answers. The novel has been labeled “chick lit” and the movie a “chick flick” by some critics. Those labels, I think, are fair. The plot is predictable, the dialogue unimaginative and the ending disappointing. But when, in the movie, Louisa kissed Will for the first time and—later—when they danced, I couldn’t decide whether to shout “You go, girl!” or “Don’t do it, sister! Do have any idea what kind of mess you’re getting yourself into?” I did neither, of course. Instead, I pulled a wad of greasy popcorn napkins out of my purse and dabbed at my eyes, just like all the other women (and some of the men) in the cool, dark theatre were doing. There are worse ways to spend a steamy Saturday afternoon.